Poured into a Pint Defiance tulip. The body is a dark brown with a finger tan head. Aromas consist of dark chocolate, fresh and toasted coconut, and coffee. Flavors are the same. Medium bodied with low carbonation. Pours dark brown small bar pour head. Smell toasted malts and coconut, light coffee and coco. Taste is the same toasted coconut, makes light chocolate and coffee notes. Finish light coffee, coconut and herbal hop kick. A solid Porter. Dark brown to black with a ruby tinge when held to the light. Quite opaque. Topped with a finger and a half of beige head. Smells of chocolate, coconut, molasses, malt, and soy sauce. Tastes of chocolate and coconut, rich, slightly sweet, and very smooth. Medium, velvety body, with a little smooth carbonation. Got in Redding, drinking here Aug 23rd, 2018. Excellent brew. 22oz. capped bottle into Night Shift stemware. Shared with schen9303. Nose is delicious. Hints of toasted coconut, cocoa powder, bittersweet chocolate, lactose and coffee. Deep and much richer than the 6.2% ABV would suggest. Beer opens smooth milk chocolate, cocoa powder, lactose and coffee with milk. There's some overtones of toasted coconut but I'd like a little more. Finishes lightly tart and roasty. Body is light with ample carbonation. Prickly on the palate and foamy and aggressive going down. Lingering, sticky finish. Very drinkable. This is actually really enjoyable despite the somewhat muted flavor in some respects. Worth trying. Creamy, sticky pale tan, long lasting head. Dark brown color. Aroma- nice, 4+ salted caramel, chocolate, also in flavor, along with coconut (fresh from shell, not like Mounds bar). Burnt sugar, molasses, funk? Toasty. Flavor-interesting 4+. Smooth and creamy, easy drinking. Bittersweet finish. L: Poured from a bottle to a pint glass. Had a dark brown color and a thick consistency. There was an inch of off white, creamy, fairly long-lasting head. Pretty good lacing. S: A good aroma of chocolate, malt, coconut, and coffee. T: Tasted of some roasted malt notes, a fair amount of coconut (could have used a little more), a good shot of chocolate, a hint of coffee and light hops in the finish. A decent flavor that's a bit uneven in spots. Some of its ingredients (like the advertised coconut and chocolate), could have used a little push. Still, pretty tasty. F: A well-carbonated beer with a super smooth finish. Medium-bodied. O: This beer has its rough spots, but it's oddly drinkable. Worth a look. This was poured into a becher pint glass. The appearance was a dark brown color with a one finger white to off white foamy head that dissipated at a nice pace. Lacing was sporadic and gleaming around the glass nicely. The smell had the roasty cocoa bean along with some sweet coconut subtly balancing in underneath. Light coffee. The taste was moderately sweet with a nice roastiness to it. Coconut comes back to balance nicely. Light sweet to roasty coffee/coconut aftertaste running into the finish. On the palate, this one sat about closer to a medium on the body. A little more beef than expected from Porters, eh, I’m not worried. Overall, nice Porter for the most part exemplifying all of the qualities of the style and then Caldera taking it and adding the coconut. I’d say its good for what it is. I’d have again. Pours a deep brown to black with a small brown head. Nose is of chocolate, coffee and toasted malts. Sort of missing the coconut on the nose. Taste of a dry chalky bakers chocolate, light espresso and roasted malts. Again somewhat missing the coconut. Definitely pick up a tiny bit on the nose but had hopped for more. Medium body, creamy with a dry chalky finish. Good beer but could use a shot of coconut. 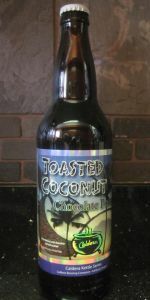 Caldera's Toasted Coconut Chocolate Porter. 6.2% ABV. A: Black in the glass. Almost three fingers of tan head. Reddish honey brown in the dimple. Decent sheeting and thin, solid lacing. S: Light, but distinctive Almond Joy aroma. Hint of char. Poured from a 22 oz. bottle, into a Belgian tulip glass. Doesn't have the depth of color I've come to expect from a porter, virtually no head at all. Nothing special to note about the smell. The taste is initially good, though it has a slightly unpleasant after taste. Probably wont buy this beer again.